Mama went to the store this morning like she usually does on Saturday...When she got home she said she had a B-R-I-B-E for me....First I asked her what exactly a B-R-I-B-E was. She said if I dressed up like a tree rat (and behaved) for the the little ones that came up our drive way for treats ...then I could have the goodies that she bought later tonight. This is a pretty cool bribe....New squeaky stuffy, new bandana, my favorite rawhides, a new VERY LARGE Bone...and CHEETOS!!!!! Hmmmmmm...What do you guys think I should do??? For Cheetos...it might be worth the humiliation, plus there is lots of attention to ME involved. The End of Vampire Season!!! Please welcome Brutus, our guest demon!! Isn't he the cutest little devil you ever did see! Go visit Brutus and hurry up and enter his Pawsome contest! 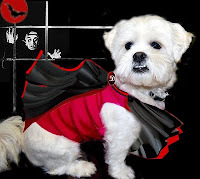 It seems like just yesterday we had our very first Vampire Puppy Club Friday...and tomorrow is Halloween ALREADY!!! This week, for the last VPKC of 2009 we are honoring all of our furriends that have put up with Mama's lecturing and my silliness. with twenty green papers by tomorrow. Cause in our books you are all very special furriends with very special humans!! Mama will work on the card and have it put together and on our bloggie Monday! The VPKC will start up again on the first Friday of September 2010!! PeeEss : Stay tuned to see if Mama REALLY dresses me as a squirrel tomorrow, and how she will EVER keep me from running away!!! I am having a dress rehearsal for Halloween, Mama surprised me with a new costume this year!! What could I be this year??? or maybe a big lioness that says....ROAR!!!! Oooo a hoodie!! I am sure I am going to be a lioness NOW!!! How do I look Mama...like a scary LION???? Daddy...you are NOT going to let her do this are you??? Gives me real human food including LOTS of cheetos!! and most of all does NOT DRESS THEIR FURIENDS LIKE NASTY TREE RATS!!!!! Don't Worry I Fixed It!! Mama is SOOOOOO LUCKY she has me!! Now for the bad news....If you have voted, or asked Mama to vote for you we need you to come back and vote again...We are so sorry, but if Mama would have sat next to me to begin with maybe we wouldn't have would not have had this problem....Hope you learned your lesson Mama!! Thanks to Daddy for some awesome pictures of me! The votey thing is on the side....Now it is time to get ALL your friends to vote for you...There is only ONE VOTE PER PERSON....so try your bestest to get EFURRY BODY to come and vote for you!!! To help you do that, Mama has made evfurryone who entered a button so they can post and tell all your friends to come over and vote!! The polls will be open until next Monday at 11:59pm...So get voting!!! Mama and I have had a BLAST putting this all together!!! It gives us smileys just looking at all our friends smile!! !